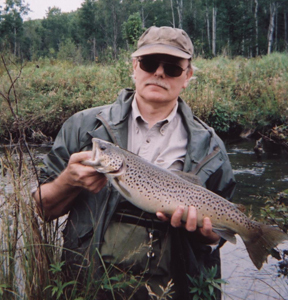 The Pigeon River State Game Area in the northern lower peninsula of Michigan is home to some great trout streams and also some nice lakes including Pickerel Lake which has a campground and boat launch (unpaved for row boats and canoes). There’s a sandy swimming area but it’s not a beach proper where the sand extends beyond the lake. Most people lay out blankets on a grassy area near the boat launch and swim there. The lake has a variety of fish species including rainbow trout, bass, perch and bluegill. A couple of us trout fishermen stopped at the boat launch one night and talked with a guy who pulled up in his row boat. He showed us his catch and he had a respectable number of decent bluegills and a few trout. The next evening, as a social endeavor, we decided to try fishing the lake from the shore which allowed us to gab while experimenting to see what might work for the trout. 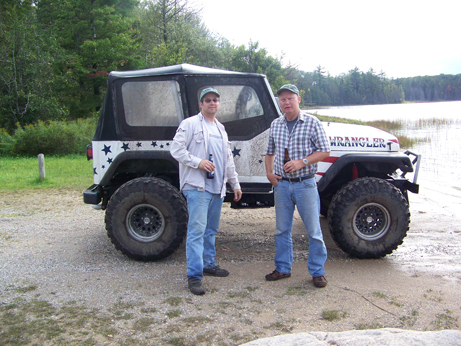 A pair of Loons was working the lake and having much better luck than ourselves – so we waded out from the boat launch and tossed our crawlers out past the drop off. We stripped out line and went back to shore and set up some forked sticks and waited. It didn’t seem like we had the right program until we got ready to leave and found three fish on our various lines including a bass, a perch, and a rainbow. By then it was dark but we learned a lesson – hold onto the line and feel for the strike. A year later we tried it again. This time we worked the shoreline by the campground and caught a respectable number of bass, bluegill, and a few trout. Here again it was more of a social engagement, lots of jabs, a cold beer, and a chance to fish a different way than the more serious solo trout fishing we do on the trout streams. The lake produces fish easily. Use crawlers or worms with or without a bobber. Someday I’d like to take a boat out on the lake and explore, fish the drop-offs, and cast for bass. The DNR made some improvements to the campground a year ago in hopes of luring more campers. If you are thinking about checking out the Pigeon River area it is a nice spot to camp for fifteen dollars a night. There’s a ranger station further up Sturgeon Valley Road (turn left on Twin Lakes Road after you cross the Pigeon River) that provides free maps of the two tracks and hiking trails. Driving around in the morning or evening you can see deer and elk. I’ve seen some postcard bull elk just driving around. 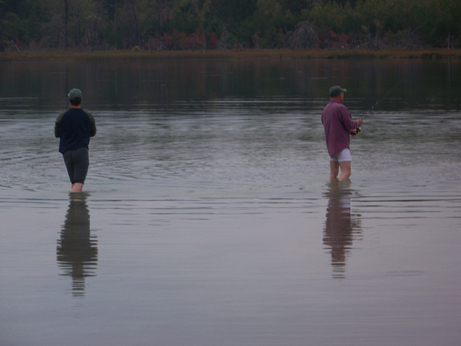 Pickerel Lake is centrally located to some of the best trout streams in the state including the Pigeon and the Sturgeon. Fishing the lake in the evening is a nice change of pace from wading and casting streams.